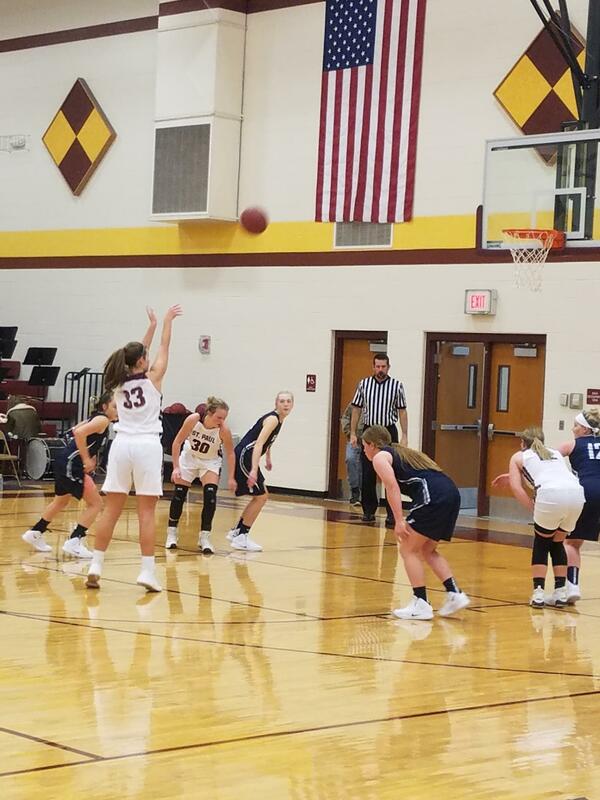 Junior Katie Coomes attempts a free throw as she led the Indians in scoring with 17 points Friday night as the Lady Indians would go on to defeat the Galena Bulldogs 45-32. Photo Courtesy. 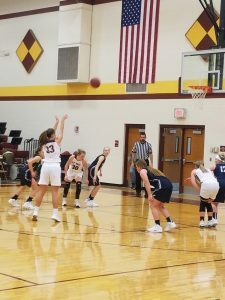 The St. Paul Indians’ girls’ and boys’ basketball teams started off their 2018-19 season Friday, Dec. 1 as they faced off against the Galena Bulldogs. On the girls’ side, St. Paul wasted no time establishing a lead by scoring 13 points in the first quarter and only allowing Galena to score four points. St. Paul scored an additional seven points in the second quarter, as Galena scored nine more points and began waking up. At the half, the Indians led the game with a score of 20-13. St. Paul stepped up their performance in the third quarter, scoring seven points and allowing only four as St. Paul maintained their lead. In the fourth quarter, St. Paul outscored the Bulldogs again as St. Paul’s early seven-point lead in the first half kept Galena just out of range. The final score of the game came to 45-32, establishing St. Paul’s girls’ first victory of the season. Junior Katie Coomes came up huge for the Indians scoring 17 points. Freshman Claire Bradshaw came up big as well for St. Paul as she finished the game with 12 points. During the boys’ game, St. Paul had a tough time against the always dangerous Galena boys’ team. In the first quarter, St. Paul earned themselves nine points, but the Bulldogs couldn’t miss as they scored 14. The second quarter revealed much of the same aggressiveness from both teams, as St. Paul scored 8 points closing the gap as Galena scored 11. At the half, Galena led by eight points with a score of 25-17. St. Paul refused to let Galena’s lead grow in the third quarter and stayed just behind Galena, scoring 11 and allowing seven. In the end, the Indians held strong but the Bulldogs proved to be too much for St. Paul. As the fourth quarter came to an end, St. Paul was defeated by scoring 10 additional points and allowing 14, bringing the final score to 46-38. St. Paul’s next matchup will be on the road this Tuesday, Dec. 4, against the Chetopa Hornets.